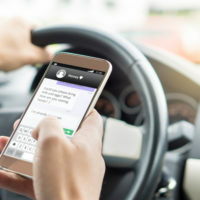 As the rates of fatal accidents on US roads continue to climb, many experts assert that the culprit is the ubiquitous use of mobile phones by drivers. A recently-released study sought to uncover just how much drivers increased their risk of a crash by either talking or texting while driving by studying video footage of drivers from inside their vehicles. Learn about the results of this study below, and contact a seasoned New York personal injury lawyer if you’ve been injured in a crash with a distracted driver. The recent report was released by the AAA Foundation for Traffic Safety. Researchers based their conclusions on studying video footage taken from inside over-3,000 participating drivers’ vehicles, comparing their phone use in the moments before a crash with their phone use at other times. Researchers calculated increased crash risks associated with texting or emailing, having a phone conversation while holding their phone, or using a hands-free device to speak on the phone. The researchers found that drivers who engaged with their phone both manually and visually, such as by texting, emailing, or browsing the internet or Instagram, had an up-to-eight-times higher risk of being involved in a crash as they did when focused on the road ahead. Drivers who had phone conversations increased their risk of being in an accident by up to four times, and the study found no significant difference between drivers who used hands-free devices and those who didn’t. If you’ve been injured in a crash with a distracted driver in New York, find out whether you’re eligible to file a personal injury lawsuit based on your injuries by contacting the knowledgeable, effective, and seasoned Manhattan personal injury lawyer Leandros A. Vrionedes for a free consultation at 212-889-9362, or in Queens at 718-777-5895.